Jazz Standards For Ukulele contains 25 jazz standards are presented in arrangements for the Ukulele, including: As Time Goes By • Fly Me to the Moon (In Other Words) • How High the Moon • Isn't It Romantic? • The Lady Is a Tramp • My Foolish Heart • A Nightingale Sang in Berkeley Square • On the Sunny Side of the Street • Summertime • Tangerine • What'll I Do? • and more. 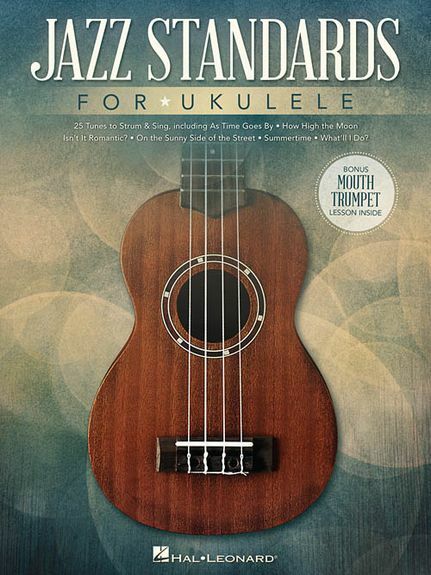 This book includes an extra mouth Trumpet lesson – because playing Uke is even more fun when you add the melody on Trumpet, using only your Voice!